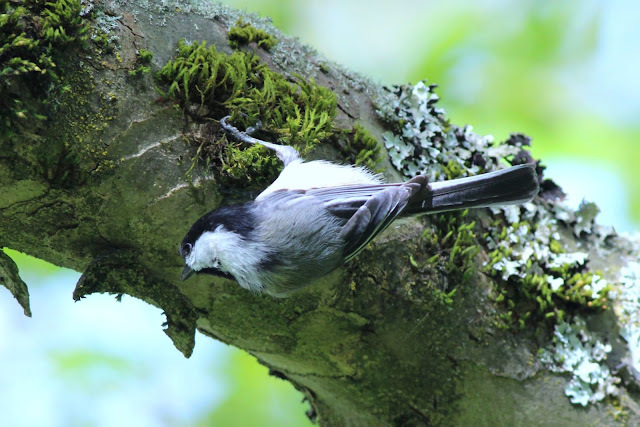 This Sunday had a real mix of places and birds. The last stop would be the best by far. I started out at John Hendry Park (better known as Trout Lake) chasing some bird report that I don't even remember as I write this. There were very few birds there, so I changed course and headed for Queen Elizabeth Park. I always park near the golf course and tennis grounds and was greeted by the sounds of a Chickadee as I got out of the car. Near the pitch and putt course I met some Asian birders who were busily snapping photos. 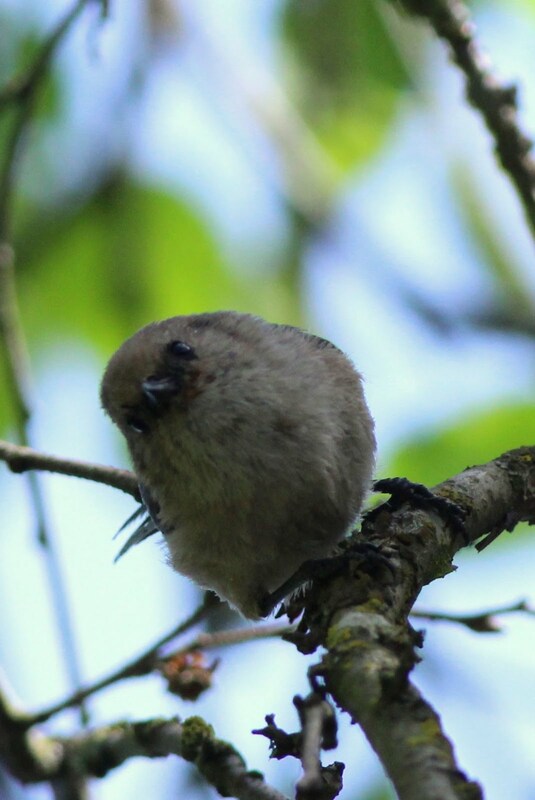 I saw what they were shooting - Bushtits. 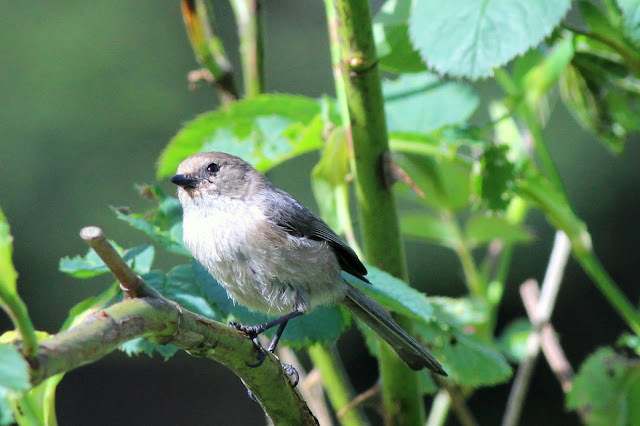 I took a couple of decent shots of this always entertaining small bird. I made my way across the park towards the Duck Pond hoping to see some flycatchers or warblers, but there were none. The migration bonanza appeared to be over. My next stop was Richmond where I visited Iona Regional Park near the Airport. I was hoping to see some migrating shorebirds and possibly some late Warblers. I entered the gate by the sewage ponds and immediately spotted a pair of Gadwall ducks, first the male and then the female. 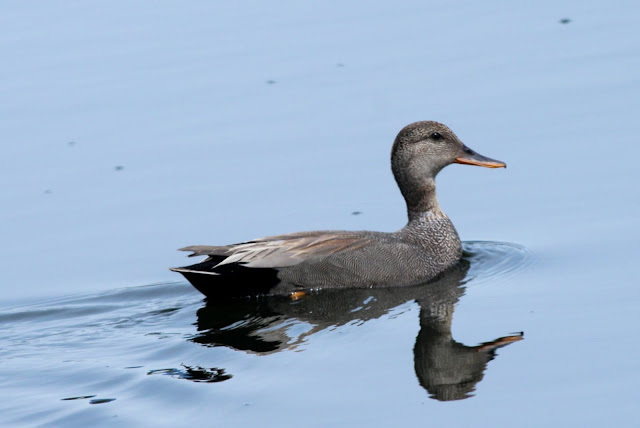 Another species of duck that can be seen on the ponds in late spring is the Blue-winged Teal. Today was my lucky day, I spotted some with my scope, but they were too far away for photos. 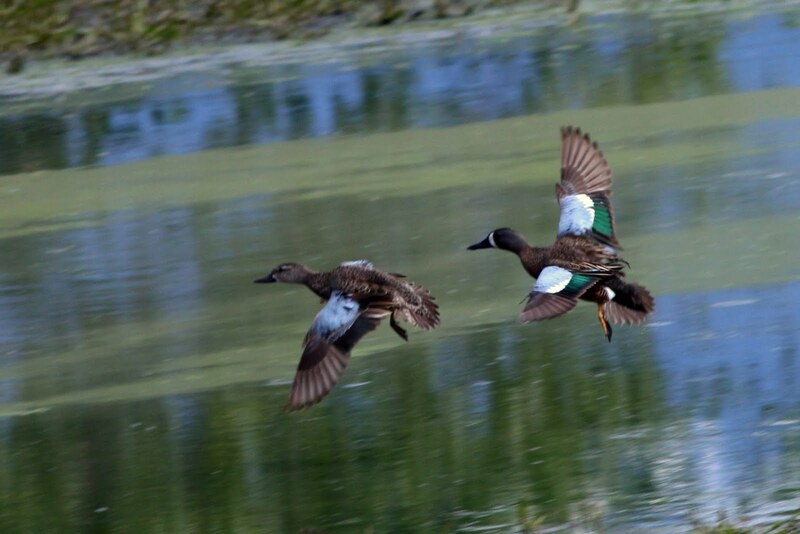 As I made my way to the end of the pond, near the gate to the rest of the park, a pair took flight. This shot shows how they get their name, the female is leading the way. I went through the gate and headed north towards the path along the Fraser River. 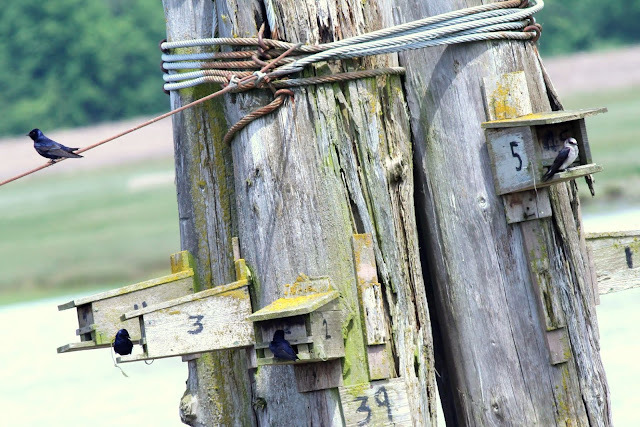 There are nesting boxes for Purple Martins mounted on pilings in the river. I was able to get some better photos than the ones in previous posts from Blackie Spit in Surrey. 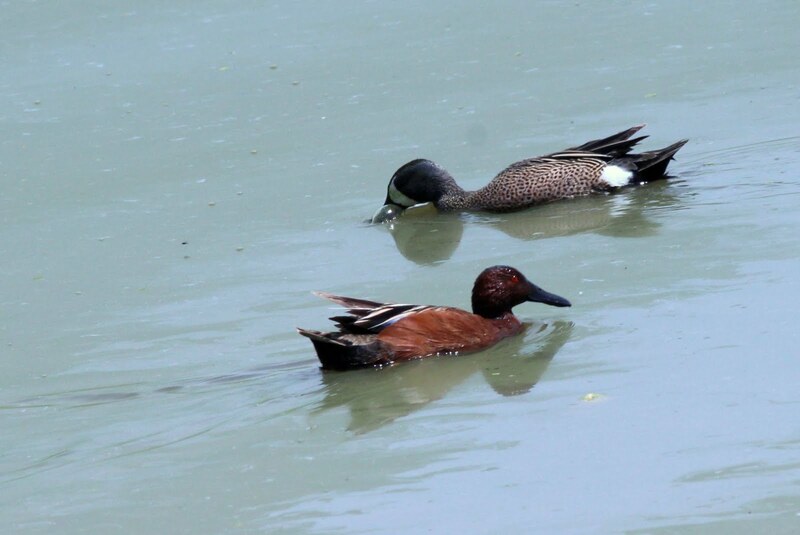 The darker birds are males, the ones with white breasts and head are females. Here's a cropped close-up of a pair. 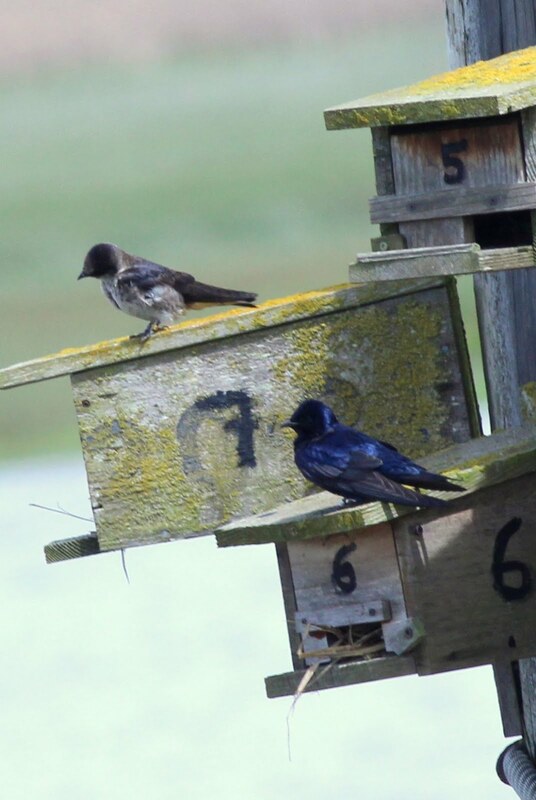 Some of the boxes are used by Tree Swallows, the Martins don't seem to mind them. 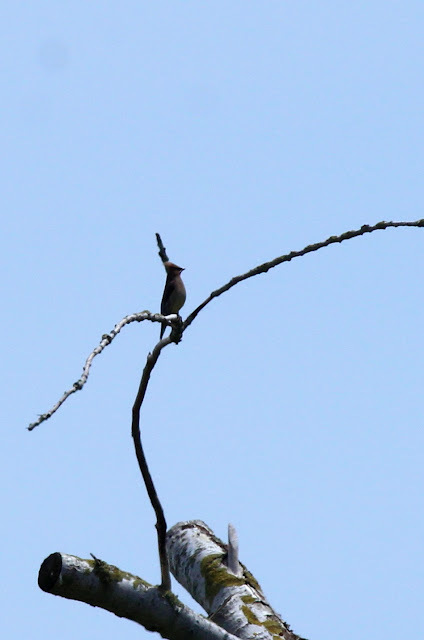 On my way back to the Sewage Ponds I spotted a familiar Spring migrant, the Cedar Waxwing. The photo quality is poor, I'd get some better ones in the coming weeks. As I re-entered the Sewage pond area I was very fortunate to see that a few Cinnamon Teal had arrived. 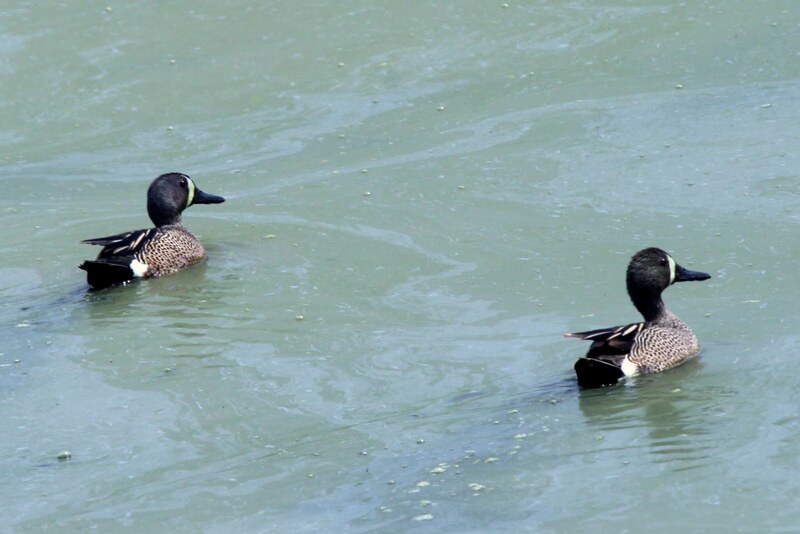 Although their plumage is very different, this species is very closely related to the Blue-winged Teal. In fact they sometimes interbreed, producing hybrids. 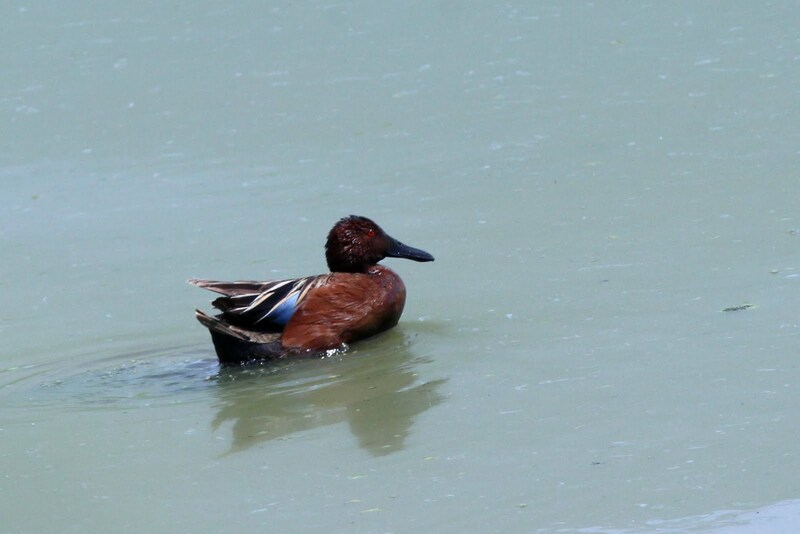 The plumage on the male Cinnamon Teal is unmistakeable. 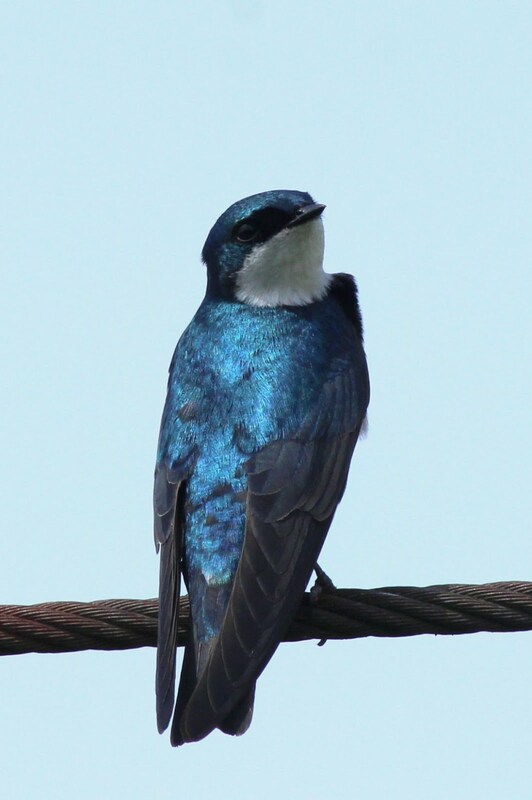 You can see the similarities in the two species in this shot, both males. As I was about to leave I met up with another birder and we walked out together. We disturbed a Killdeer as we passed and it made the usual fuss that they are famous for. 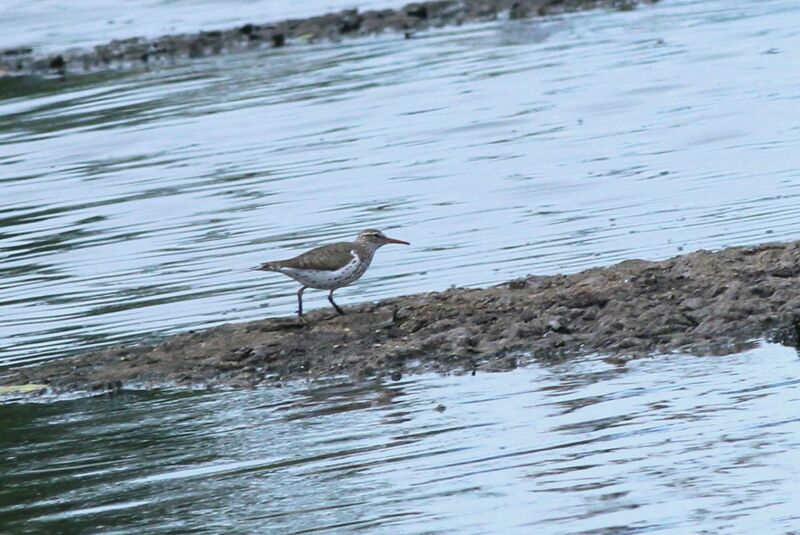 We then "spotted" another mid-sized shorebird. A quick check with the scope showed that it was a Spotted Sandpiper. 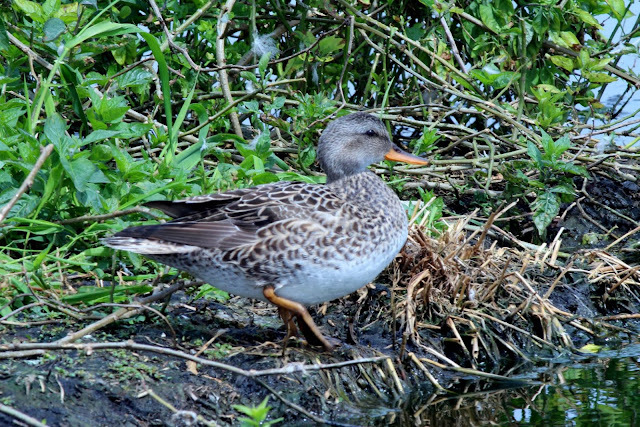 In spring breeding plumage the spots are very evident. 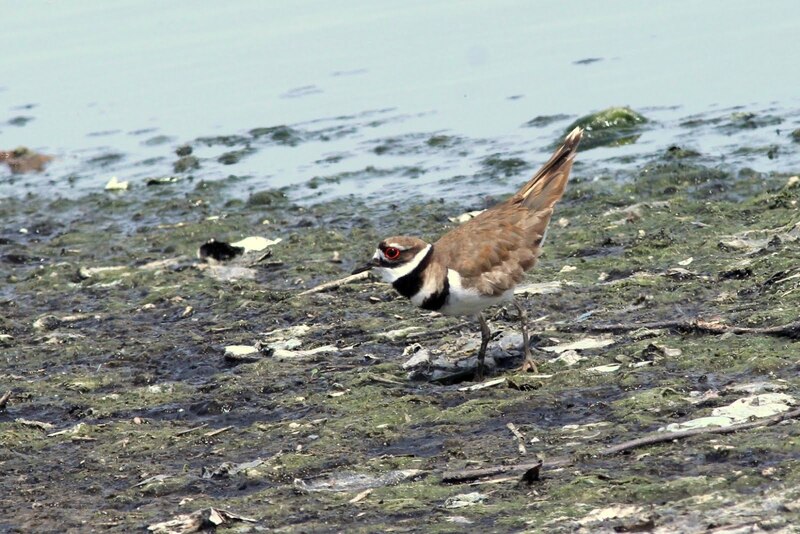 In Fall, the bird is a basic brown and white. It was mid-afternoon by now and time to head for home.